It is the holy festival of Yasaka Jinjya Shrine. This staple of Kyoto summer culture is not only one of the three great festivals of Kyoto, but is also counted as one of the three great festivals of Japan. Gion Matsuri originated from praying for preventing the spread of plague about 1,100 years ago. It begins on July 1 with the “Kippu-iri” ritual, and continues until the “Eki-jinja-nagoshi-harae” on the 31st. 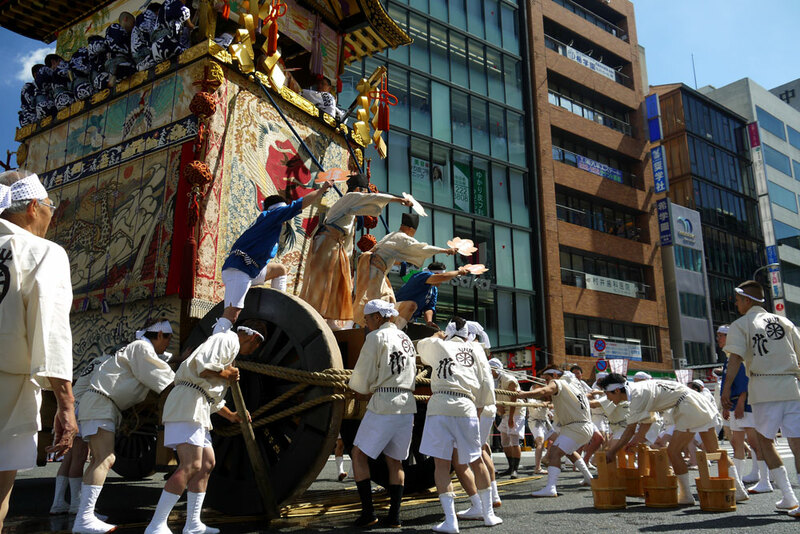 July 1st-5th : Kippu-iri, held in each Yamahoko neighborhood. Signifying the beginning of the rituals, meetings will be held for the festival during Kippu-iri. A spear will be kept in each meeting place, as a symbol of an enshrined deity. July 2nd : Kujitori (Lottery) Ceremony at Kyoto City Hall, 10:00 a.m.
July 10th : Lantern Reception 4:30 p.m. – 9:00 p.m. In preparation for the purification of Yasaka Jinja Shrine’s mikoshi (a portable shrine), a procession will leave the shrine along a path of paper lanterns. Children will perform the Sagi (Heron) and Komachi Dances. July 10th : Mikoshi Purification at Shijo Ohashi Bridge, 8:00 p.m. – 8:30 p.m.
Yasaka Shrine’s mikoshi are carried to Shijo Ohashi Bridge, where they are ritually purified with water from the Kamo-gawa River. The highlight of the Former Festival. The best highlight of the festival is the Yama Hoko Junko grand procession. From 2014 the Former Festival (Saki Matsuri) procession on 17th, and Latter Festival (Ato Matsuri) procession on 24th will be held. 29 floats out of 33 are designated as the important intangible cultural properties. The festival was selected on September 30, 2009 to be added to the list of intangible cultural heritages of humanity. “Yoi-Yoi-Yoiyama” means the event in three days before the main festival. 14th. “Yoi-Yoiyama” means the event in two days before the main festival. 15th. “Yoiyama” means the eve of the main festival. 16th. 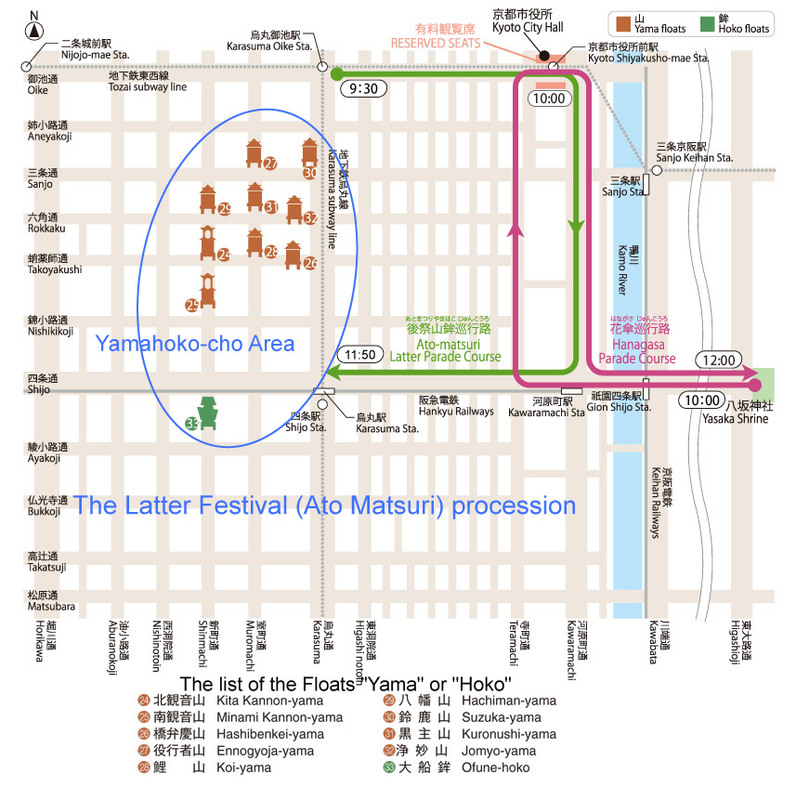 At Yamahoko-cho Area ― see below the map, Each Yamahoko-cho decorates “Yama” or “Hoko” (floats) gorgeously and lights komagata paper lanterns. Many people come in or around Shijo and Karasuma streets listening to the festive music played mainly with flutes and gongs. “Byobu Matsuri” will be also held. During these Yoiyama nights, in the Yamahoko-cho area Kyomachiya (old family houses and established business houses of Kyotian-style) remove the lattice doors and show what is called “Byobu-kazari” (the decoration with their family heirlooms and folding screens). So the event is also known as the Byobu Matsuri or Folding Screen Festival. Yama Hoko Grand Procession (Former Festival). 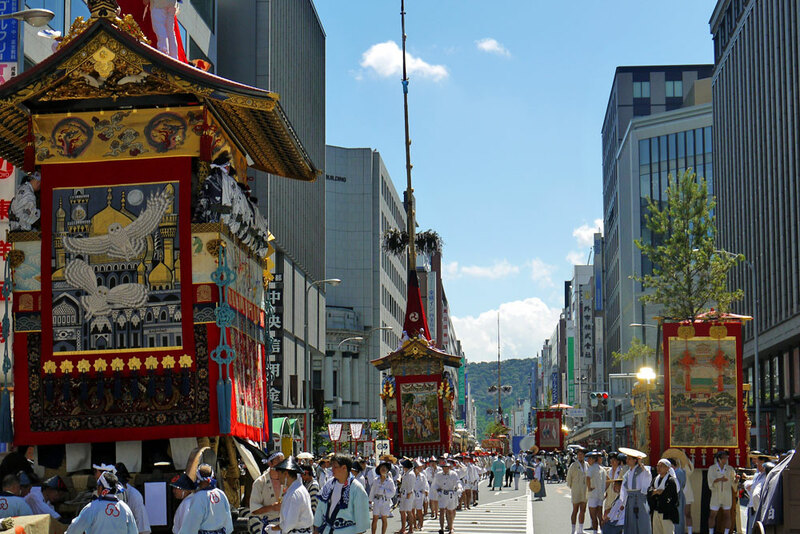 “Yama Hoko Junko” is thought to purify the various parts of the old capital as the parade of brightly resplendent floats passes through them. Click and See more Information and Movies. “Shinkosai” of the Former Gion Festival. At night 17th. in the night of the former YamaHoko Junko. Yama Hoko Grand Procession (Latter Festival Procession). Hanagasa-Junko also happens on the 24th. Unfortunately Hanagasa-Junko was decided to cancel because of high temperature forecast on July 24 2018. The first decision in this situation due to abnormal weather. More about the Gion Festival.